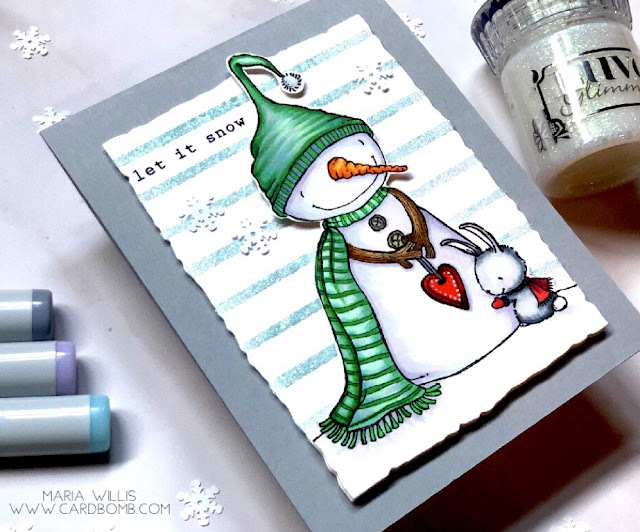 Cardbomb: Most Adorable Snowman and Bunny! 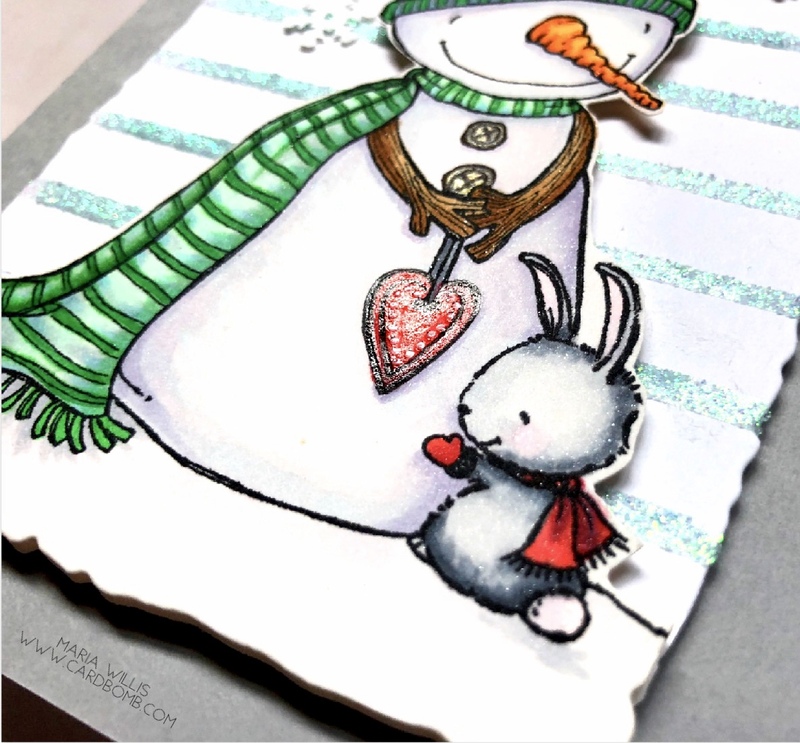 Most Adorable Snowman and Bunny! Hey guys! I don't know what day it is where you live (because you might live on the opposite side of the world from me) but here in California, USA it is late Friday night, almost Saturday, and I am stoked for the weekend! I'll be hosting Christmas Eve and my house is a disaster, making my gifts and I haven't even started, need to mail some cards but have to make custom envelopes because I made weird size cards....you get the picture. I'm hoping to have at least a few major things done by the end of the weekend. Well, before I hit the ground running on all of the things I've got to get done I thought I'd share a card I made this week. On my last post I shared a card using stamps designed by Stacey Yacula and I've got more where that came from today. I wanted to play along with this week's Freshly Made Sketches and this stamp seems like it was made for this sketch (check out sketch at the bottom of my post). This tall snowman is so sweet and his little bunny friend is absolutely adorable. I used my Copic Markers to color the snowman and bunny and then I fussy cut around the top of the image leaving the bottom wide. Then I used the Deckled Edge Dies from Honeybee Stamps to cut out both the background and the base of my image so that they would line up perfectly. 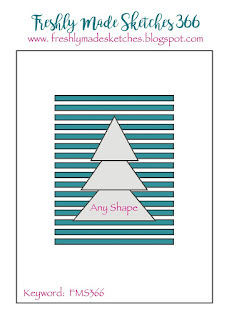 I used Tonic Studios Nuvo Glimmer Paste and some washi tape to create a shimmery striped background. I also used a clear glossy pen to add some shine to the heart ornament in the snowman's hands (are they hands or twigs?). It's really hard to see it in these photos but I colored the snowman's buttons gold with a gel pen. If you're noticing a little bit of sparkle on this adorable duo it's because I did my coloring on shimmer paper. That sentiment in the top left is from a Penny Black set called, Christmas Bunch. After adding some fun snowflakes to the background I used foam adhesive to pop up my characters as well as the whole background piece. Here's that awesome sketch from Freshly Made Sketches challenge #366. Head over and check out all of the awesome projects created by the design team if you have a few extra minutes to be awed. 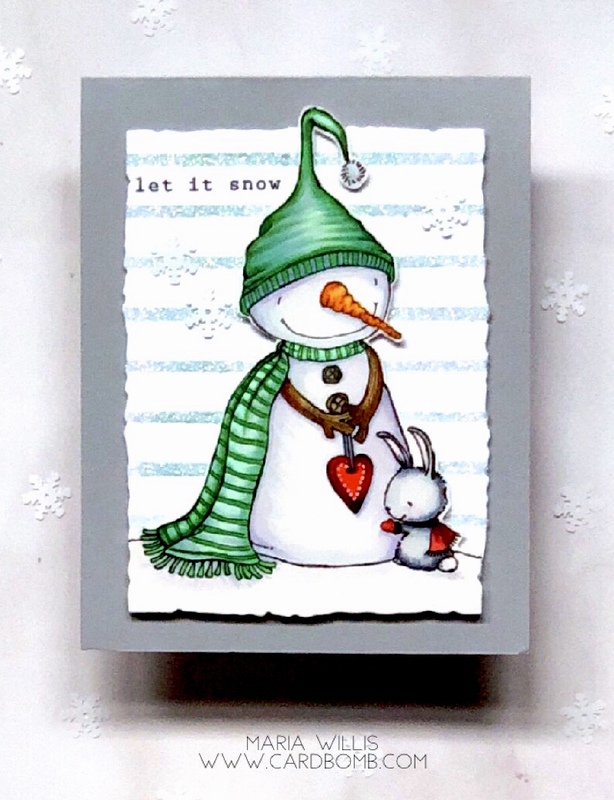 I'm also going to add this card to the Simon Says Stamp Monday Challenge this week because B is for Brrrr.... and these two are out in the cold! I'm glad they've got each other though because those hugs will help keep them toasty. Ok, guys, I'd better go get some cleaning done before I go to bed. Before I go I'm going to add some links to the supplies I've used today. If you feel like doing a little shopping I'd love to have you use my links. When you do I make a small extra commission (at no extra cost to you) and it helps me keep my blog going. Have an amazing weekend and I'll see you back here soon! Thank you so much! I’m akways trying to get better. I love these stamps! Thank you for the kind words Maura! A-maz-ing! Love your coloring! So glad to see you this week at FMS and thanks for entering our DT call! Oh my goodness! 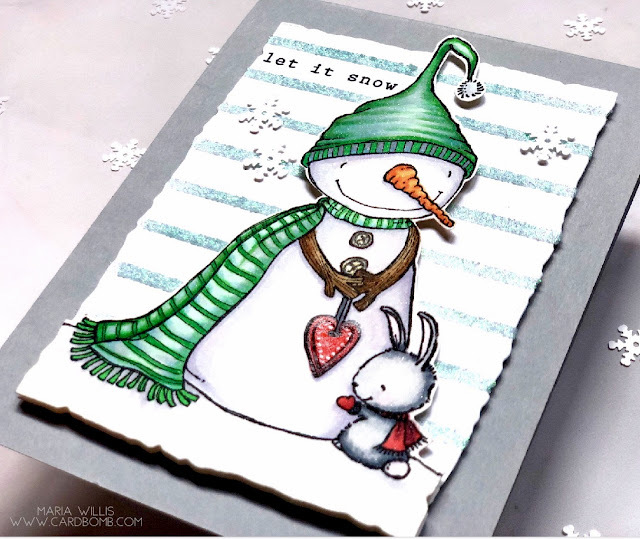 Sweetness overload with this snowman! Thanks for joining us at FMS this week!